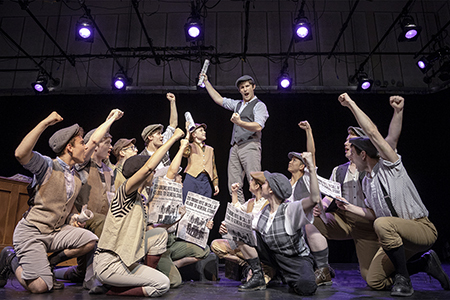 Jack Kelly (Rob Ryan), center, is ready to fight the good fight with the support of his newsies. Photo by Robert Terrano. 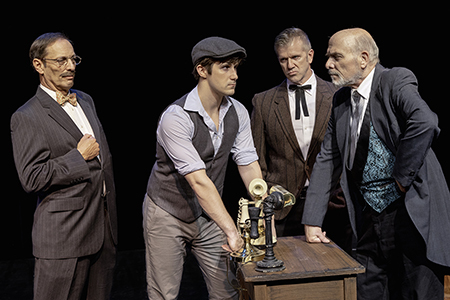 Newsboy Jack Kelly (Rob Ryan) takes a stand against Joseph Pulitzer (Peter Sauer). Also pictured are Pulitzer's men, Ken Marblestone, far left, and Jim Morris. Photo by Robert Terrano. 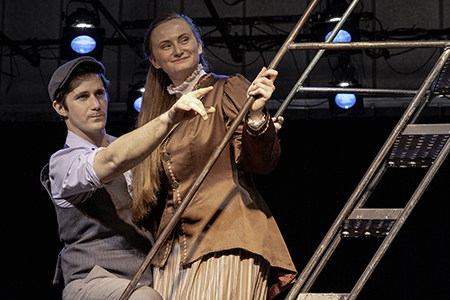 The faces of change: newsie Jack Kelly (Rob Ryan) and reporter Katherine Plummer (Bridget Hughes). Photo by Robert Terrano. 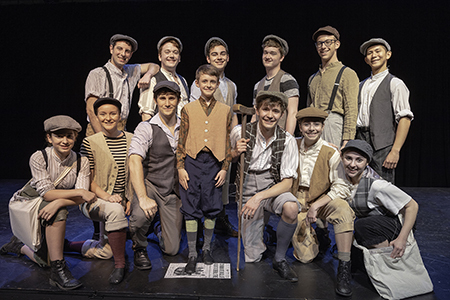 Meet the "Newsies," front row, from left, Bridget Godfrey, Faith Stack, Rob Ryan as Jack, Camryn Burniston, Ted Braun as Crutchie, Julia Patella, and Lauren Barkman; second row, from left, Jeff Rosenthal, Nicholas Kianka, Jake Hamstra, Jacob Long, Ethan Lipper, and Diego Montealegre. Photo by Robert Terrano. West Windsor, N.J. – The stage is set for a David-versus-Goliath battle as the curtain goes up on a new season at Mercer County Community College’s (MCCC’s) Kelsey Theatre with Disney’s "Newsies The Musical.” The award-winning PinnWorth Productions presents this blockbuster musical Thursdays, Sept. 6 and 13 at 7:30 p.m.; Fridays, Sept. 7 and 14 at 8 p.m.; Saturdays, Sept. 8 and 15 at 8 p.m.; and Sundays, Sept. 9 and 16 at 2 p.m. A reception with the cast and crew follows the first Thursday and Friday night performances on Sept. 6 and 7. Kelsey Theatre is located on MCCC’s West Windsor Campus, 1200 Old Trenton Road. Free parking is located next to the theater. The cast stars Rob Ryan of Gladstone as Jack Kelly; Bridget Hughes of Jackson as Katherine Plumber; Sean Dickinson of Jackson as Davey Jacobs; Ted Braun of West Windsor as Crutchie; Camryn Burniston of Parin as Les Jacobs; Peter Sauer of Yardley, Pa., as Joseph Pulitzer; and Mimi B. Francis of North Brunswick as Medda Larkin. The main “newsies” include Nick Buonvicino of Green Brook, Ricky Francese of Somerset, Rashawn Garrett of Willingboro, Charlie Gormley of Morrisville, Pa., Jake Hamstra of Bayville, Adam Juraga of Morrisville, Pa., Nicholas Kianka of Hamilton, Matthew Krauss of Yardley, Pa., Ethan Lipper of Millstone, Jacob Long of Haddon Heights, Diego Montealegre of Lawrenceville, Michael Mottram of Cream Ridge, Julia Ruth Patella of Cranbury, Matthew Robertson of Yardley, Pa., Matthew Snyder of Levittown, Pa., Faith Stack of Allentown, Lauren Barkman of Richboro, Pa., Abby Harnum of Bordentown, and Haley Schmalbach of Palmyra. Featured in the adult ensemble are Jeff Dworkin of Langhorne, Pa., Ken Marblestone of Langhorne, Pa., Jim Morris of Plainsboro, Todd Roman of Fords, Christopher Schmalbach of Palmyra, and Joe Zedeny of East Windsor. Other ensemble members include Nic Fallacaro of Yardley, Pa., Bridget Godfrey of Old Bridge, Joshua Goldhammer of Plainsboro, Zamir Gorden of Lawrenceville, Charlotte Gougher pf Newtown, Pa., James LeGette of Levittown, Pa., Jeff Rosenthal of Dayton, and Zakir Zaidi of Princeton. The production team includes Producer/Director LouJ Stalsworth; Co-Producer and Set/Costume Designer Kate Pinner; Co-Director/Choreographer Koren Zander; Music Director François Suhr; Company Production Manager and Light Designer Robert Terrano; Sound Designer Evan Paine; Stage Manager Dennis Tolentino; and Assistant Stage Manager Reilly Bowe. Properties are by Sue Galli. Tickets are $20 for all and may be purchased online or by calling the Kelsey Box Office at 609-570-3333. Kelsey Theatre is wheelchair accessible, with free parking next to the theater. Discounted subscription series for the 2018-19 season are still on sale. For a complete listing of adult and children's events, visit the Kelsey website or call the box office for a brochure. Kelsey Theatre is wheelchair accessible, with free parking available next to the theater. Most family shows include Saturday and Sunday matinees; some children’s shows are scheduled for daytime performances on Fridays to accommodate school groups. For more information or to request a printed copy of the brochure, call the Box Office at 609-570-3333.